If Tom Brady wants to play in the NFL in 2019, he’s going to have find a new helmet to wear. In a joint announcement on Friday, the NFL and NFLPA released a list of helmets that have been approved for play in 2019, and Brady’s didn’t make the cut. Of course, the announcement likely didn’t come as any surprise to Brady, and that’s because his helmet was actually one of 10 that was put on the banned list last year. As a matter of safety, the 2018 season marked the first time the NFL started legislating which helmets could be worn on the field. Although Brady’s helmet was banned, the Patriots quarterback and several other players were given a one-year grace period where they were allowed to wear their old helmet while they started the search for a new helmet. There are a total of 32 players, including Brady, who wore an illegal helmet last season and will have to make a switch for 2019. Back in May, Brady kind of hinted that he probably wouldn’t end up making a helmet change until he had to. According to Jeff Miller, the NFL’s executive vice president of health and safety initiatives, teams will be punished if any player is caught using a banned helmet. Although Brady will have to make a helmet switch, he’ll have plenty of models to choose from, and that’s because there are a total of 34 helmet models that have been approved by the NFL, including 11 that were added to the approval list just this year after undergoing extensive laboratory testing. 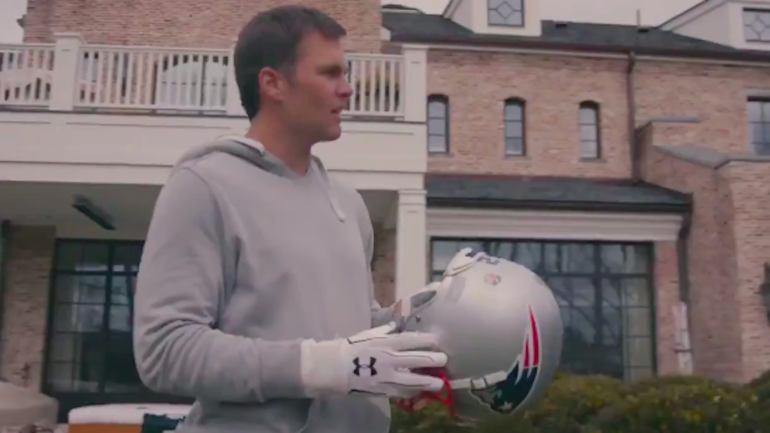 Once Brady starts practicing with the Patriots — whenever that may be — he’ll have to switch over to a new helmet, but until then, it looks like he’s going to continue to wear old faithful while doing workouts away from the team.